Feast your eyes on the world's most expensive iPhone 5 case. If your pockets run deep, real deep, then this $3,000 iPhone 5 bumper case will surely catch your attention. 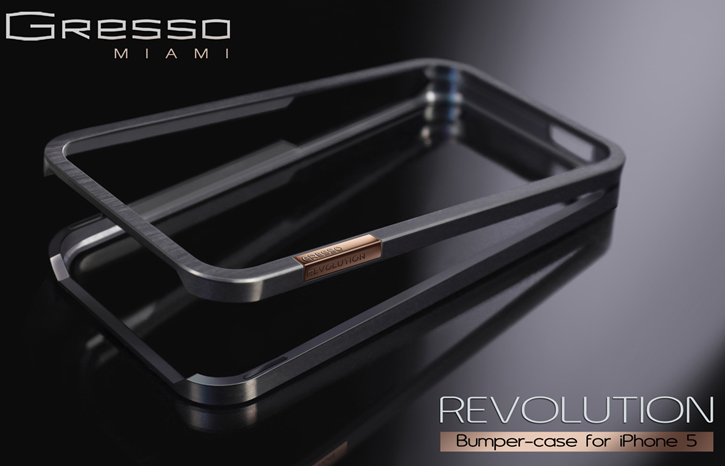 The Revolution by the luxury fashion designer house, Gresso, is a the most expensive metal bumper case money can buy. The Revolution bumper is limited to 999 serialized and engraved pieces and features a unique magnetic, two-piece seamless secured locking installation that doesn't require any screwing (that is if you've got the money). The Revolution is milled from a solid piece of titanium for its strength, light weight and resistance to scratching. The titanium is hand-finished with a beautiful slate colored and textured matte finish that undergoes a coating of PVD for additional durability. You want a logo? How about an engraved 18k gold logo inlay to top it all off. The Revolution is a fairly basic bumper, albeit offers premium material and a cool magnetic latch system. Gresso's premium bumper will go on sale on October 12th for a cool $3,000.